Like Martin Boyd pottery- examples of which have been previously posted- Studio Anna specialised in hand-painted ‘Australiana’ themes. Flora and fauna and local iconic sites were depicted – I have several Studio Anna pieces that feature local hotels [oh! the 50s glamour!] as they were sold as souvenirware. Here we have wall plates – featuring the lovely cities of Adelaide and Albury. And Moree is featured on the salt and pepper shakers. Wall plates are definetly a lost art form- you don’t find ceramic artists making them any more. These two are made with specialist hanging apparatus built into the backplate. Both Studio Anna and Florenz Pottery had their pottery studios in Marrickville, Sydney – very near when I now live. The potteries lasted until the 70s- when gentrification and housing pressures saw them close. Marrickville is still a gritty inner-city place with an industrial/suburban mix. Florenz started producing studio pottery in the 1930s and Studio Anna in 1953. These slip cast pottery items were made as souvenirware – the appropriated [and westernised] indigenous motifs were hugely popular. Post war arts and crafts saw a rise in the popularity of Australiana – replacing traditional English motifs with ‘Australian’ themes; and invariably Aboriginal motif works were black, tan and white. The crab plate has some very minor chips on its edge [click on the image for zoom view] – and is marked Studio Anna on the underside. I am particularly drawn to the funky rounded-triangle shape of this piece. The dish and ashtray are unmarked, but presumed Florenz Pottery due to the quality/typology of the images and glazes. The three pieces make a nice ensemble with the rich ochres, and black and white patternings. I am particularly drawn to kitsch pottery that has landscape or botanical images…so souvenir ware from the 50s is right up my street! I have posted Studio Anna pottery previously- you might remember that it was situated right near where I now live, in inner-Sydney. This very kitschy souvenirware was very popular in the 50s – and then it went out of fashion [in a big way] in the 70s and 80s. Rightly so, the appropriation – and kitschisation- of indigenous motifs was debated and condemned. Now, in this post-modernist era, enough time has passed and enough discussion ensued that we can now look on these very dated images with fondness and nostalgia. The wall plates have a hanging device on the back, so they can be – hung on a wall; here the cities of Adelaide and Albury are celebrated. The salt and pepper shakers celebrate Moree. A nice start to a Studio Anna collection. A fantastic set of Studio Anna pieces – across the states of Queensland, Tasmania and Victoria. Studio Anna established their pottery in Sydney in the early 50s, and then proceeded to market to all states in Australia. 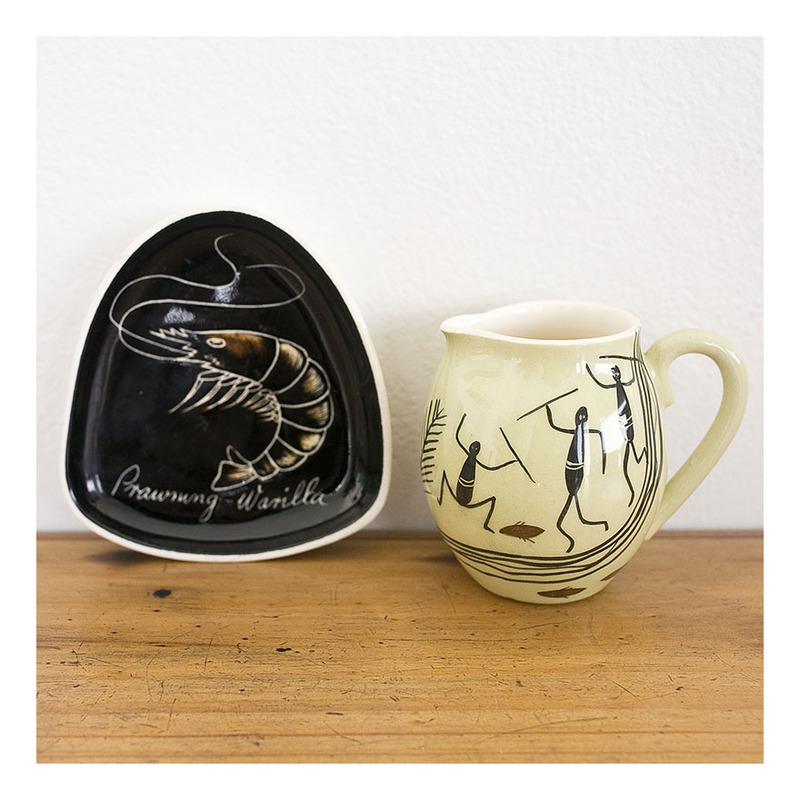 Studio Anna is recognised by the hand-signed, and hand-drawn images- incised into the pottery. Here we have a jug, “The Oasis, Brisbane”, with a pin dish “Tasmanian Devil” and then a plate “Bright, VIC”. All recognised as Studio Anna work, but not hallmarked as such- each of the pieces are early, and small- and so don’t lend themselves to backstamps or labels. Studio Anna made souvenirware for tourists to take home from Australia in the 40s and 50s- and here we have a lovely pin dish from Alice Springs inscribed ‘Flynn’s Church.’ Clearly, Flynn’s Church was a] an important institution in Alice Springs and b] in Alice Springs. I love the bland churchy rendering of this image- it could be any of a hundred churches built in the 50s – so I suspect it was mass produced for the many- but given a hand-inscribed name for the few. I’m a great fan of Studio Anna – hand-renderings in ceramic glaze of the 50s and 60s in Australia- a wonderful portrait of the times. I have amassed a sizeable collection – see several posts below. I am particularly drawn to kitsch pottery that has landscape or botanical images…so Studio Anna art pottery from the 50s is right up my street! I have posted Studio Anna pottery previously- you might remember that it was situated right near where I now live, in inner-Sydney. Studio Anna started producing souvenir ware and art pottery in 1953, eventually closing in 1999. 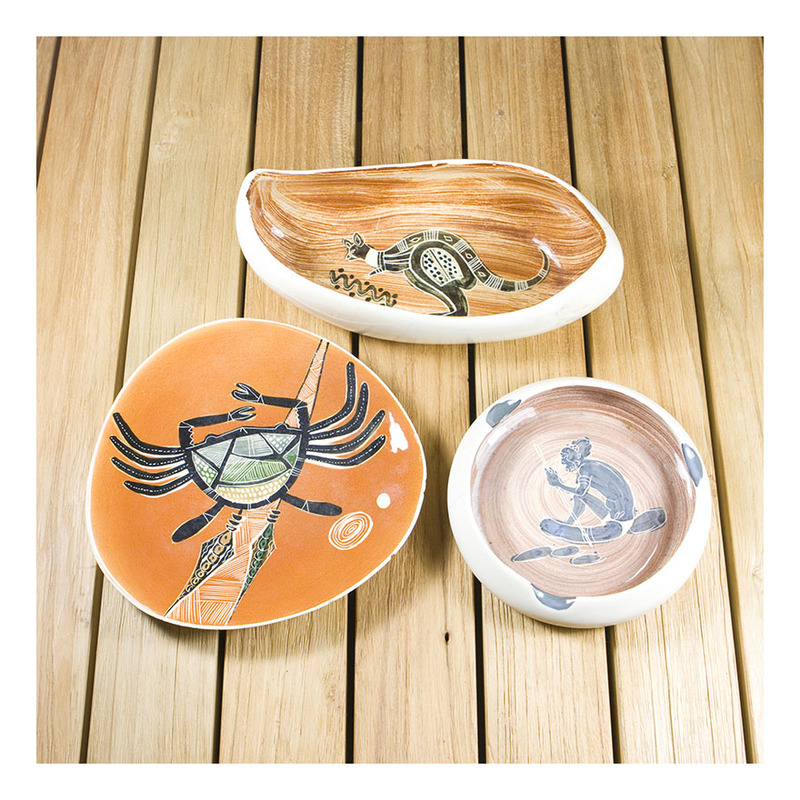 They produced a huge range of handpainted ceramics featuring landscapes, landmarks, flora, fauna and aboriginal motifs. I have in my collection – and have posted on this blog- examples of almost all their work. This plate with its inscribed in white cursive text on the lower right ‘Pincushion Hakea’ [Hakea laurina, fyi, a native of Western Australia] is rare and unusual in that the background is a stippled pink- normally the background to the image was a flat-glazed colour. The short-lived [and thus rare] stippling period is supposed by many authorities to be a reaction to other competing 50s art potters – who all used the flat colour background in their work. The other unusual- rare- thing about this plate is its form: it is unusually large, and sits on four ceramic legs made integral with the back of the plate. These little legs don’t normally survive but this larger plate- with its proportionally larger legs has. The plate is in excellent condition – it could have been made yesterday. I have posted quite a few Studio Anna and Martin Boyd pottery pieces on this blog- both very influential and now highly collectible potteries. Both potteries were pumping out souvenirware in the 50s- and this pin dish and jug are typical pieces of the time. Warilla is a seaside suburb of Wollongong- famous for its- you guessed it – prawning. Studio Anna produced thousands of pin dishes in the 50s- for hundreds of coastal towns- so it was simply a matter of changing the town name. Meanwhile Martin Boyd pottery was pumping out stylized aboriginal motif pieces for the tourist trade. I am particularly drawn to kitsch pottery that has landscape or botanical images…souvenirware from the 50s is right up my street! I have posted Studio Anna pottery previously- you might remember that it was situated right near where I now live, in inner-Sydney. 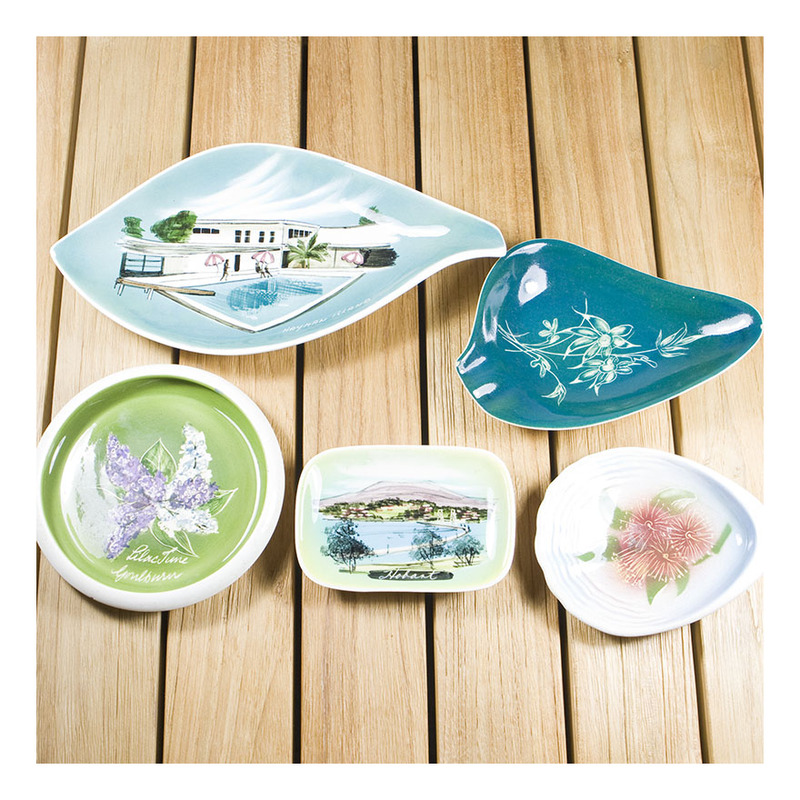 The first three dishes- to the left of the image -are by Studio Anna; the Cornet plates are the funky blue plate with flannel flowers, and the shell-shaped dish which features a eucalypt flower. Coronet pottery was a small pottery that operated in Sydney between the wars. The topmost dish, with a funky 50s hotel image [pool side perspective] is inscribed ‘Hayman Island’, which is a popular tourist destination in Queensland. The round, green dish under Hayman Island is inscribed “Lilac Time, Goulburn’ – a town featured recently on a silver tea strainer, and the last landscape dish is a view of ‘Hobart’. Having never been to Australia’s island state, I can’t attest to its 1950s accuracy, but it’s what I image Hobart would have [perhaps still does?] look like. I am particularly drawn to kitsch pottery that has landscape or botanical images…souvenir ware from the 50s is right up my street! I have posted Studio Anna pottery previously- you might remember that its pottery was situated right near where I now live, in inner-Sydney. The topmost dish, with a funky 50s hotel image [pool side perspective] is inscribed ‘Hayman Island’, which is a popular tourist destination in Queensland. The round, green dish under Hayman Island is inscribed “Lilac Time, Goulburn’ – Goulburn being a small country town between Sydney and Canberra, and the last landscape dish is a view of ‘Hobart’. Having never been to Australia’s island state, I can’t attest to its 1950s accuracy, but it’s what I image Hobart would have [perhaps still does?] look like.